Even the title, ‘The Hyperion Machine’, releases a whole gamut of associations. This chain stretches from Greek antiquity via the poet Friedrich Hölderlin, dramatist Heiner Müller and right up to Einstürzende Neubauten. That’s quite a curve! And then a bell strikes. The music begins to run its course. What begins here is more than just the regular statement from some musician; irrespective of genre. It’s something holistic, which between eternity and the blink of an eye, between whispering and screaming, reveals its diverse facets with each passing second. In its narrative force, ‘The Hyperion Machine’ functions like a radio play or audio book. And yet, the music stands up on its own. Nonetheless, whenever the listener poses the question of meaning, a whole new world appears before him. There are no packaging inserts or listening instructions for the songs. You can let them work their magic on you without having to expend any great deal of thought, but if you are the pondering and wondering kind, there is are an awful lot of thoughts you could give way to. ‘The Hyperion Machine’ poses a whole lot of questions which in turn lead to further questions. Today’s knowledge could well be obsolete tomorrow. Simple answers are only for populists and demagogues. The subtle power with which Reuter tells us his stories overrides all epochs and categories. There is nothing that isn’t permitted in this music: Rock, jazz, classical and spoken word elements come together to tell a story in 3D, which does not only build up in front of your ears, but integrates the listener. The literary and philosophical subjects are just as diverse as the musical influences. 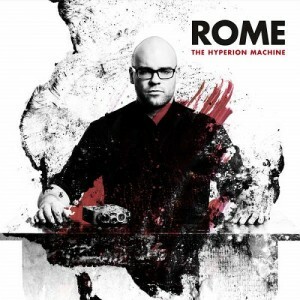 The album features songs in the vein of ROME’s trademark blends of Dark Folk (‘The Secret Germany’, ‘Celine in Jerusalem’) and Post Industrial Wave (‘Transference’, ‘Skirmishes for Diotima’). Moreover, Scandinavian fans will be delighted to find that the album also features a duet (‘Stillwell’) with legendary Swedish singer and friend Thåström. In many ways, ‘The Hyperion Machine’ is a completely normal music album, and yet it is so much more than that. A cornucopia of concrete and notional interpretations forms a great, sensual commentary on the origins of the present, over and above the here and now.